Today's recipe is a healthy pasta salad that is sauteed, giving it an interesting depth of flavor not often found in your everyday pasta salad dishes. It was both laughably cheap and laughably easy to make: it took me about 30 minutes from start to finish the very first time I made it--and I could have handled the prep work with the broccoli far more efficiently. Thus with a bit of practice, you could potentially get this entire dish made in around 20 minutes. It was a quick, delicious and healthy meal, perfect for an evening when you don't have a lot of time to cook. 1) Add salt to a large pot of water and bring to a boil. Briefly blanch the broccoli for 1-2 minutes, until tender but still crunchy. 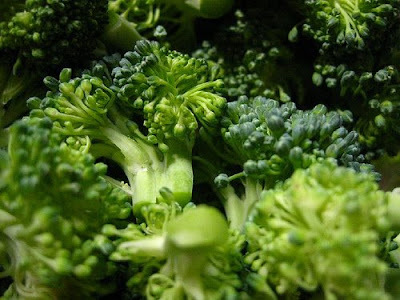 Using a slotted spoon, remove the broccoli from the boiling water and set broccoli aside (but save the water). 2) Bring the water that the broccoli was cooking in back to a boil and use it to cook the penne until al dente, according to the package directions. Drain well, and briefly rinse the pasta in cold water. 3) Heat the olive oil in a large, deep, non-stick pan over medium-high heat. 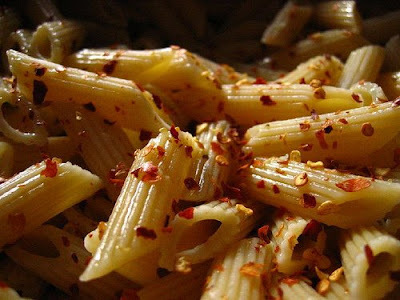 Add the penne and red pepper flakes, and saute for 1 minute, stirring frequently. Add the chickpeas and broccoli florets and saute for about 4-5 minutes, stirring frequently, until the ingredients are lightly browned in places and the pasta is fully heated through. 4) Remove from heat, add the lemon juice, then toss and serve immediately. This recipe gave us an unexpected bonus: an excellent opportunity to apply some recipe modification skills. The original name of this recipe was Sauteed Penne with Cauliflower and Chickpeas. Unfortunately, after seeing the cauliflower inventory in our grocery store's produce section (they were $3.99 per head and, judging by their pathetic size, not exactly in season), I knew I had a problem. But I wasn't going to let this minor obstacle crush my spirit. Instead, I asked myself what would be a good substitute for mild-tasting vegetable like cauliflower? All I had to do was wander around in the produce aisle for a couple of minutes until I saw enormous, healthy-looking broccoli bunches selling for less than a third of the price of the stunted cauliflower nearby. Bingo. It isn't rocket science, obviously, but basic ingredient substitutions like this are classic examples of simple recipe modification. Today's substitution also enabled me to make this recipe at a higher quality and a much lower cost than if I had been stubborn and kept the recipe as is. Here, basically any firm vegetable will do, as long as it can survive a little bit of browning in a saute pan. Green beans, peas, even chunks of firm (and probably best unpeeled) eggplant would do nicely in this recipe. In fact any of these substitutions also provide a nice dash of welcome color that was missing from the recipe in its orginal, anemic form. If you want less spicy dish, obviously add less red pepper. But if you want a much less spicy dish, then wait until the very end to add the red pepper flakes (add in with the lemon juice). The longer the red pepper gets sauteed in the oil along with everything else, the more it has a chance to infuse the entire dish with heat. And in the picture below, that's real live steam coming off our dinner. No photographic dirty tricks here. This recipe is better if you toss the broccoli and chickpeas with a little EVOO, salt and pepper, and roast for 20 minutes at 400-425 degrees. And add a couple cloves of minced garlic to your red pepper flakes. Try this variation - it's amazing. I love your suggestion. Thanks for stopping by and sharing your insights! Can you tell me more about substituting eggplant? Do I boil the eggplant first the way I would the broccoli? J: good question, and I think the answer is "it depends." If you slice or chop the eggplant into very thin pieces a quick sauteeing might be sufficient to cook the eggplant. However, if you prefer to cut the eggplant into thicker pieces, then you'll probably want to blanch/cook them in boiling water for a couple of minutes first. This is great with a little feta cheese tossed in the mix! Great, great idea Jennifer. Thank you for sharing! 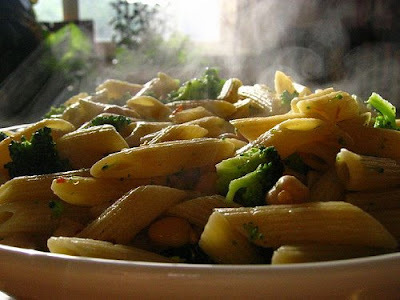 In addition to substituting other vegetables if broccoli is expensive or unavailable, other beans can be substituted. And using cooked dry beans almost always saves money, gives better flavor, and eliminates concerns about chemicals in the lining of cans.